If someone is spending the night, then you will want to make them feel at home. That starts with a comfortable bed. Sometimes, sofa beds are better off staying as a sofa as opposed to pulling out the bed. It might help if you actually try to sleep on your sofa bed to see if it really is comfortable. The same can be said for a guestroom bed. Is that room warm enough at night? Are the pillows fluffy enough? Do the linens smell fresh? Those are things that are easily taken care of. Everyone loves staying at a hotel and getting a mint on the pillow. You don’t have to go that far but it would be nice to have some bottles of water in the guest room so your visitor doesn’t have to go looking for a drink in the middle of the night. They would also appreciate having a coffee station set up in your kitchen. You can get this ready the night before so that whatever time they wake up they’ll have a fresh pot of coffee or tea waiting for them. 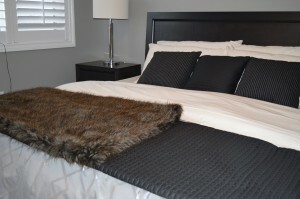 It also helps to get rid of any clutter that might be piled up in the guest room. You would never want your company to have to move things out of the way just to get into the room. This is where call to Junk King Cincinnati can make a big difference. These professional junk haulers can sweep into your home and take away any amount of unwanted furniture, appliances, electronics or other household goods that you want to get rid of. You can also turn over to them all the unwanted clothing from closets and dressers. You’ll feel a lot better about inviting holiday guests over once Junk King Cincinnati has cleared out the rubbish from your home. This entry was posted in Cincinnati Junk Removal and tagged holiday guests, Junk King, junk removal on November 30, 2017 by Junk King. Last updated December 1, 2017 .